What´s it Like to Vacation in Nice Right Now? The team behind thinkingoftravel.com sends their thoughts and prayers to everyone affected by the tragic events on 14th of July, especially the victims and their families. As a consequence of the horrific acts we are getting lots of questions from people who have booked their holidays to Nice and are not sure if they should go or not. Nice is still one of the best vacation spots on the Mediterranean and we see no reason not to go. Restaurants, cafés and shops are running as normal. You will notice more police around. You will notice some reporters and cameramen on the Promenade. A part of Promenade d`Anglais is closed where you will see people paying their respects to the victims. The citizens of Nice are doing their utmost to keep “business as normal”, doing what they have always done, but you understand that there is great sorrow under the surface. 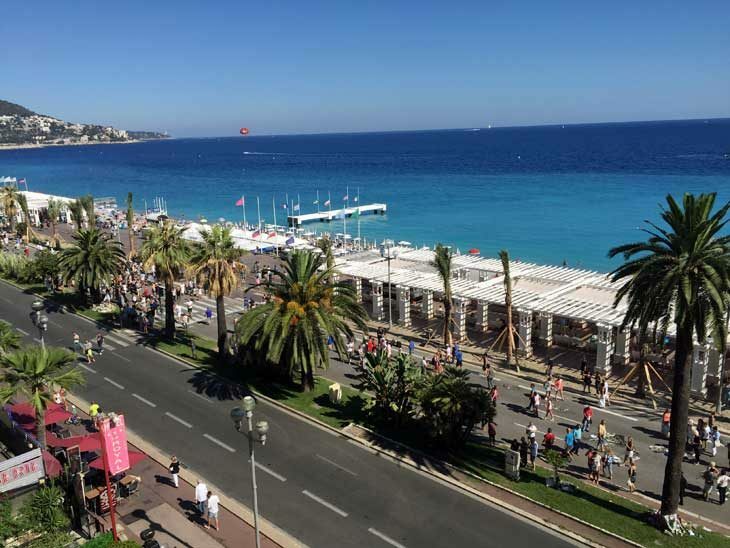 The ultimate decision is always the individual´s but if you are worried that your vacation will be tarnished and not up to par, we can safely say that you will have a great vacation in Nice. If Nice has been good to you in the past, you should definitely stand by Nice in times like this. Where ever you are: enjoy your summer holidays and please send an extra prayer to those who as suffered unnecessary acts of violence. Yesterday the Interior Minister visited Promenade D´Anglais and lots of people gathered for a silent minute. The Promenade D´Anglais is now cleared from flowers, candles and memorabilia and now open for traffic in both directions. Do you have more on Nice right now? I really would love to hear from you via email, in the comments below, on Twitter, Facebook or Google+.